So, I’ve why I have done another competition and plan on doing a whole lot more! Things are finally settling down after this weekends competition down in London! For those of you who are not aware I competed in a National Fitness Model Competition, The FMC (Fitness Model Comps. I am very happy to tell you I came 3rd in my Category of Bikini Diva, earning my Elite Pro Athlete Card! I am so happy I placed as this is my 5th time doing a competition like this and each time I feel I improve. 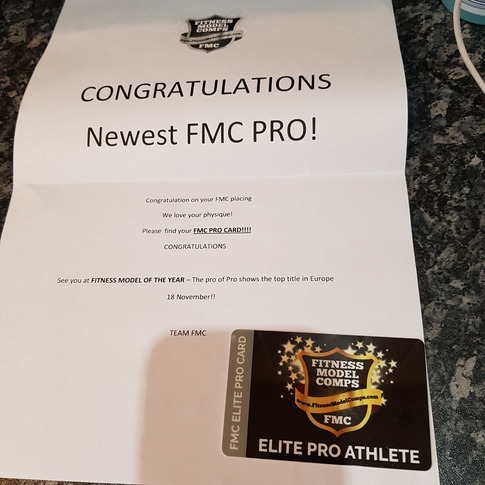 It is so gratifying to get recognition for all my efforts from a Fitness Federation like this one although it is not the whole reason why I compete. It’s a question I am asked regularly, why do I choose to put myself through all that prep? The restricted diet and gruelling training regime are tough, but I just love the whole process! Sounds bonkers I know and for people that know me well this comes as no surprise, but I love it because it is that hard! Clients often tell me how difficult they find it to exercise and sometimes whilst they are training say to me why is this so hard?! My response is if it doesn’t challenge you it won’t change you. For change to happen you must be out of your comfort zone. You must get familiar with being uncomfortable because that is when the adaptation happens. Albeit physically or mentally. Once you have challenged yourself to do something that makes you feel uncomfortable your comfort zone expands and you find yourself reaching further and doing more. Life gets full as the boundaries expand! Suddenly things that bothered you or scared you before come as second nature! As I made I took to the stage on Saturday just gone for the first round I was nervous, my knees still shake when I go out for the first time every time! With this competition, I decided to enter more than one category, I entered 3! For each one there are 2 rounds, this meant I was on stage 6 times on Saturday! By the end of the day I felt more and more confident. My posing got better as I felt more comfortable and I got my first placing in this type of competition and I was so proud of myself your conquering my fears and doing it anyway! My next competition is a week on Saturday, 28th April 2018 at Elite Bodies Nottingham, Fitness model and Bodybuilding Show. I have entered 3 categories again, Ladies Toned Body, Bikini over 35’s and Ladies Theme. This is another chance to get out on that stage and out my comfort zone. I am determined to beat my nerves and nail my poses to show all the hard work I have put in for the last 9months of training consistently 5 days a week! Any one who has done this deserves the right to show and celebrate their achievement in making their body change shape. Why not give yourself permission to shine, I find it a real privilege to be on stage with other like-minded people who have work as hard as me to get their bodies in the best possible shape they can. We all have a mutual respect as we all know how hard the journey is, and I have become friends with many of these ladies and gents, keeping in contact with them via social media and meeting up at the shows. It’s so much fun! So why bodybuilding? I love bodybuilding I find it incredibly rewarding and fulfilling. I find that having a strong healthy body helps create a strong and healthy mind. The two things, mind and body as so closely linked. If you feel healthy you think healthy. The routine of regularly exercise is good for you mentally as well as physically. It sets you up for the day and creates healthy other habits too. Looking at the how you fuel your body too is also a great thing to do. If you get your fuel right not only does it help build muscle, it sharpens your mind. The right water intake and food really helps your performance at work as it helps you concentrate better and stops you feeling lethargic. Have a great week and hopefully I will be back with more great news after my next competition!